5 Bedroom Detached House For Sale in Leicestershire for £345,000. 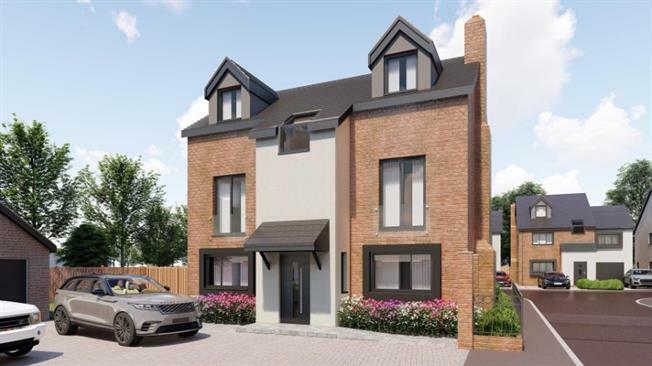 Shaw Lane is an exclusive development of just 13 new homes, each home has been designed and finished to a very high specification, comprising of three, four & five bedroom properties. The development is currently under construction and is due to complete Summer 2019. Help to buy is available on this development and is a government funded scheme. Only 5% deposit required. The property is over three floors and comprises with spacious entrance hallway (6.83m x 1.93m) that includes under stair store cupboard, downstairs W.C.(1.96m x 0.91m) Lounge to the front of the property - (4.45m x 3.23m) plus a separate sitting room / study area - (3.23m x 2.24m). Tthere is a separate Dining Room (3.45m x 2.54m) with french doors leading out to the garden. Breakfast Kitchen (5.56m x 3.73m overall) that includes ceramic tiling to walls and floor, built in appliances including an electric oven, four ring gas hob with extractor fan plus integrated fridge/freezer and dishwasher. The first floor comprises of three double bedrooms, Bedroom Three - (4.47m x 3.25m) - With twin french doors to a Juliette balcony. Bedroom Four - (3.94m x 2.97m) - with twin french doors to a Juliette balcony to the front aspect of the property. Bedroom Five - (3.45m x 2.57m) - With twin french doors to a Juliette balcony to the rear aspect of the property. There is a Family Bathroom - (3.25m x 2.18m) that has a shower in cubicle, plus bath with ceramic wall and floor tiling. On the second floor there are two double bedrooms, the Master Bedroom - (5.72m x 3.23m) with en-suite (2.54m x 1.50m) - Fitted with a three piece white suite with shower in cubicle and ceramic wall and floor tiling. Bedroom Two - (5.74m x 3.48m) also has an ensuite - (2.51m x 1.47m) - Fitted with a three piece white suite, a shower in cubicle, with ceramic wall and floor tiling. To the outside of the property there is a large driveway offering ample off road parking, plus a detached brick built garage. There is a paved patio area and garden to the side of the property. Turf will be included in the sale. There is also a security alarm included in the property. CGI included in this listing are for illustration purposes.